When he was playing football as an 8th grader at Huntsville Middle School in 1987, Keith Humphrey thought for sure he’d soon be taking his considerable athletic skills to nearby Huntsville High School. But after his family moved into the Lee High zone, he wound up playing for the Generals instead. 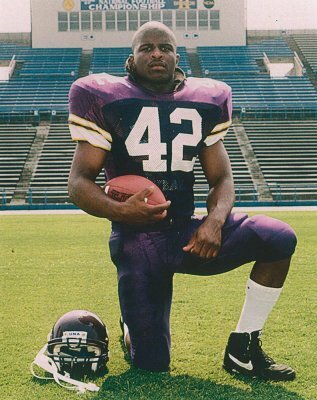 He went on to become one of Lee’s all-time best linebackers at a school that has produced the likes of Keith Butler and Thomas Boyd, both of whom later played in the NFL. In a manner of speaking, history repeated itself four years later when Humphrey, who had grown to 6-foot-1 and 190 pounds, was ready to test his gridiron mettle at the college level. Widely recruited by schools throughout the Southeast, Humphrey had essentially settled on Jacksonville State, where coach Bill Burgess’s Gamecocks were in the midst of a torrid stretch from 1990-’91-’92 in which they advanced to the NCAA Division II national championship game three straight years and finally won it all in ’92. “They really had it going at Jacksonville and I decided that I wanted to be a part of that," recalled Humphrey. Then along came David Martin, an assistant coach on Bobby Wallace’s staff at the University of North Alabama. “He told me that he saw our playoff game against Hewitt-Trussville and said I played the most amazing game he’d ever seen a high school linebacker play," Humphrey said. “After that, I switched to UNA." Teammate Israel Raybon, Lee’s first-team All-State defensive tackle from Lee, also picked UNA. Offensive lineman Scott Sharp, another senior All-Stater from Lee, chose Georgia Tech. Humphrey, Raybon, and Sharp were major contributors to the greatest back-to-back football runs in Lee High School history. After finishing 1-9 the year before, the Generals’ administration persuaded its highly competitive baseball coach Butch Weaver, a Lee alumnus, to take over the football program in addition to his other duties. How did that work out? Sensationally. In his first two seasons as the football head coach, Lee went 8-2 in 1990 and 11-2 in 1991 while advancing to the semifinals of the state playoffs. Humphrey believes Weaver’s old-school approach was the main reason. “Butch brought in a different kind of culture," said Humphrey. “He believed in hard w ork – I mean, hard work – and he was a stickler for discipline. Plus, we had a lot of young kids who loved football and we were tired of losing. We also learned a lot the year before, even though we didn’t win but one game. For me, I developed a reputation of being a hard-hitter. I put a lot of work into getting better with my junior year, and it worked." At North Alabama: Humphrey played on Bobby Wallace’s UNA teams that were a combined 48-5-1, including three Gulf South Conference championships and three Division II national championships. For his career, he had 380 career tackles with 250 primary stops, 49 tackles for loss of 139 yards in losses, 4.5 sacks for 23 yards, and nine interceptions. He set school records for career tackles for loss (49) and fumbles recovered. As a senior, he had 21 tackles for loss, 2.5 sacks and three interceptions as the Lions’ defense led Division II in rushing and scoring defense, and was second in total defense. UNA also led the GSC in all four defensive categories. Humphrey was named to the Gulf South Conference “Team of the Quarter Century" for 1971-95, the GSC “Team of the ‘90s” and the “50th Anniversary UNA Football Team for 1949-98”. Following his career at UNA, he served as a graduate assistant coach in 1999 under Bobby Wallace at Temple University before receiving his Master’s degree in Education from Temple. At Temple, he coached Dan Klecko (“one of the best football player s I’d ever see"); Klecko, a defensive tackle, went on to play in the NFL for New England, Indianapolis, Philadelphia and Atlanta, and won three Super Bowl rings with the Patriots. As a grad assistant, he’d cut up tapes on Michael Vick, Lavar Arrington and Ed Reed, and interned in 2000 for the Philadelphia Eagles. “It was stay an intern or finish school," Humphrey said. “I chose school. After leaving the Eagles, I started working with at-risk youth in some of the most dangerous neighborhoods in Philadelphia. I’d work as a Behavioral Specialist, TSS, Mobile Therapist. These opportunities would lead me to doing some amazing work and meeting some amazing people in Philadelphia, Camden, NJ and Tre nton, NJ."